Synthetic maps of integral natural and technogenic-natural hazard are used in various management procedures. The main possible goals are strategy planning for the territory development, decision-making for a placement or protection of infrastructure objects, and risk management. A traditional approach provides map compiling as follows. At first, experts in every type of hazard compile maps for each hazard. As a rule, these maps show zones of various hazard intensities. When the total number of considered hazards is small, then it is possible to demonstrate all the hazards in one map. In other cases, some algorithm is applied to compute the integral index. The final map shows the space distribution of this index. A popular method of numerical scores calculates the integral index as a sum of scores that are attached to each intensity level of each hazard. The main defect of this method is an arbitrariness and voluntarism of attached scores. Methods of agreement of experts’ private opinions do not solve the problem of objective content of the result. Another problem is the possible correlation of various hazardous processes. For example, if a group of source hazards has a similar genesis and, consequently, the positive correlation, the procedures described above will give a preference to this group. 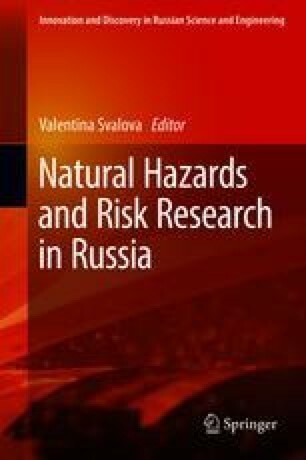 The method of the unified legend for hazard maps provides a possibility of comparing maps of various hazards from the united point of view, especially for risk analysis. The economic criteria are used in this method instead of inner properties of the processes. The method of Pareto optimum provides integral hazard maps with easy understandable legends. Multicriterion optimization finds the best or the worst areas according to source maps. Method of optimal marks attaches to each point of map a set of digital marks that explain in the optimal way differences in the set of source zonal maps. The task is dual to the cluster analysis: to find the best digital estimation for many divisions of points into clusters instead of finding the best division of points with many digital characteristics into clusters. The analysis of results is like the analysis of principal components. From the computation point of view, the procedure calculates optimal marks as a sum of scores that are attached to each intensity level of each hazard, but the scores reflect objective dependencies between data and not an arbitrariness of an expert.